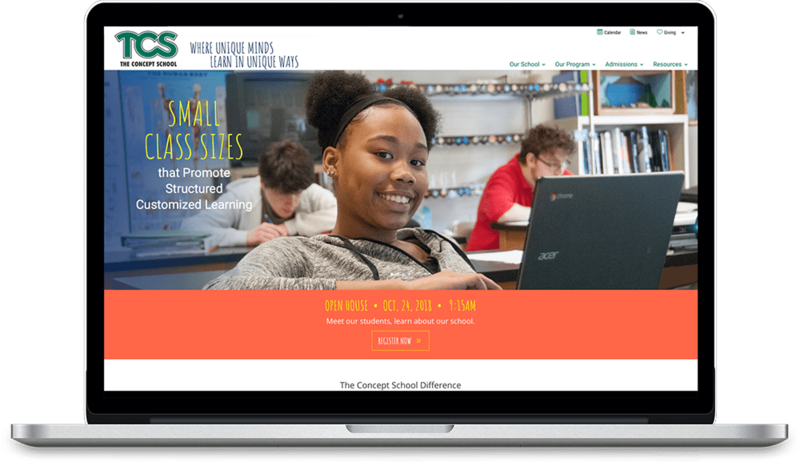 Just in time for back to school, we are happy to announce the launch of the newest Sugartown creation, a website for The Concept School, a co-ed independent school for students grades 6 – 12. Creative art direction during multiple photo shoots resulted in emotional photography capturing the genuine essence of wonderful students in their day-to day classroom environment. Copywriting focuses on what is important to both parents and students and positions The Concept School as a leader in quality caring education for special needs students. A new responsive website using content management system technology works for parents on the move and faculty who need easy updates. We just love working with clients who roll up their sleeves and get down and dirty along side us to get the job done. We would like to give a big thanks to all of the students and faculty who worked with us to make this a successful and meaningful endeavor.